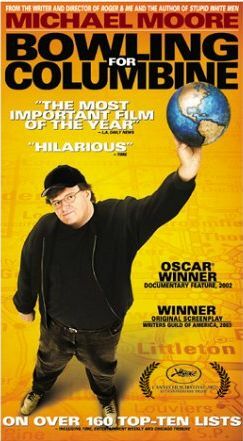 "Bowling for Columbine" is an alternately humorous and horrifying film about the United States. It is a film about the state of the Union, about the violent soul of America. Why do 11,000 people die in America each year at the hands of gun violence? The talking heads yelling from every TV camera blame everything from Satan to video games. But are we that much different from many other countries? What sets us apart? How have we become both the master and victim of such enormous amounts of violence? This is not a film about gun control. It is a film about the fearful heart and soul of the United States, and the 280 million Americans lucky enough to have the right to a constitutionally protected Uzi. "Bowling for Columbine" was the first documentary film accepted into competition at the Cannes Film Festival in 46 years. The Cannes jury unanimously awarded it the 55th Anniversary Prize. From a look at the Columbine High School security camera tapes to the home of Oscar-winning NRA President Charlton Heston, from a young man who makes homemade napalm with The Anarchist's Cookbook to the murder of a six-year-old girl by another six-year-old, "Bowling for Columbine" is a journey through America, and through our past, hoping to discover why our pursuit of happiness is so riddled with violence.